We include cleanup with all of our work. Not because we love to do it, but clients often underestimate the amount of material on a large tree and are seldom equipped to handle or dispose of it. We remove the branches, leaves or needles that remain when logs and firewood are removed. We refer to this debris as "brush". 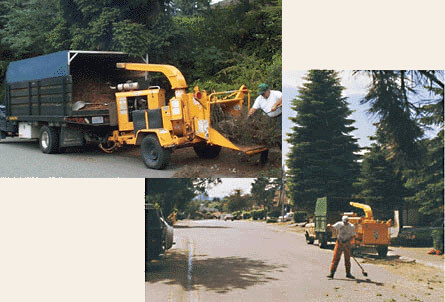 Removal of a large Fir produces about two tons of brush that must be loaded and hauled to disposal. We dispose of the chips where we are charged little or no fee. Comparing this to loading the limbs on a pickup truck, unloading them at the dump site, & paying disposal fees, the average client does not save any money for the hard work he would do. We will quote work without cleanup, but we like to be sure that the client knows how much work is involved in the disposal operation. We are proud of the quality of chip we produce. Our chips can be used for mulch, play yard surfaces, or composting with grass clippings. Call to arrange delivery of clean chips to your home, landscape project, or ranch.